Allister as regional vice president for 1974. Robert M. Loftus, assistant vice president of Moran Towing Cor- poration will replace Thomas E.
Moran, who declined reelection be- cause of pressing business commit- ments, and Capt. Ivan Ashby, man- ager, Inland Waterways Opera- tions, Mobil Oil Corporation, was elected to replace Jack Aguero, whose corporate responsibilities are outside the inland marine industry. 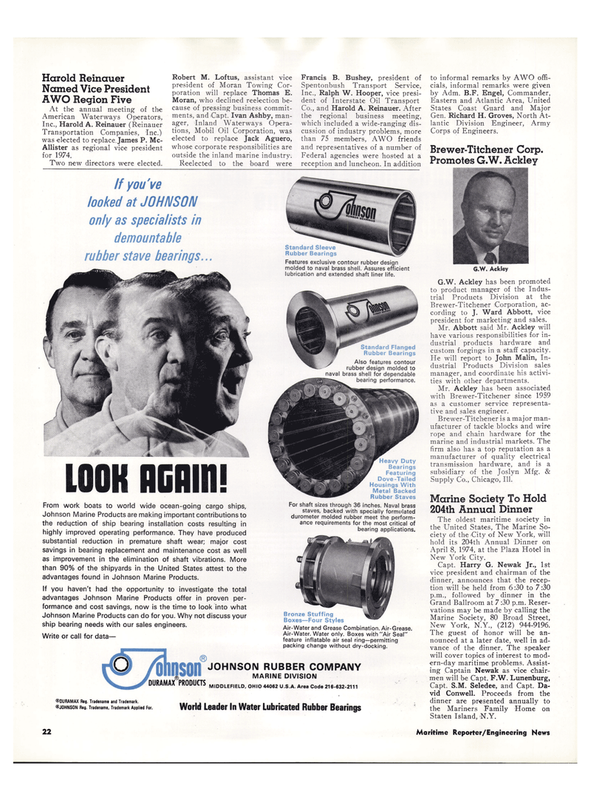 Brewer-Titchener Corporation, ac- cording to J. Ward Abbott, vice president for marketing and sales. Mr. Abbott said Mr. Ackley will have various responsibilities for in- dustrial products hardware and custom forgings in a staff capacity. He will report to John Malin, In- dustrial Products Division sales manager, and coordinate his activi- ties with other departments. Mr. Ackley has been associated with Brewer-Titchener since 1959 as a customer service representa- tive and sales engineer. New York, N.Y., (212) 944-9196. Johnson Marine Products are making important contributions to the reduction of ship bearing installation costs resulting in highly improved operating performance. They have produced substantial reduction in premature shaft wear; major cost savings in bearing replacement and maintenance cost as well as improvement in the elimination of shaft vibrations. More than 90% of the shipyards in the United States attest to the advantages found in Johnson Marine Products. Johnson Marine Products can do for you. Why not discuss your ship bearing needs with our sales engineers. Features exclusive contour rubber design molded to naval brass shell. Assures efficient lubrication and extended shaft liner life. J Also features contour rubber design molded to naval brass shell for dependable bearing performance. For shaft sizes through 36 inches. Naval brass staves, backed with specially formulated durometer molded rubber meet the perform- ance requirements for the most critical of bearing applications. Air-Water and Grease Combination. Air-Grease.